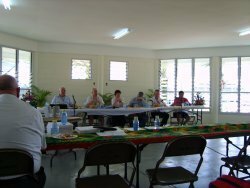 Tony Thompson and Sid Guzman attended the Mid Term Conference in Samoa. Many things were dicussed from financial statements, year in review, and ranking syetem for our region. Tony and Sid made a presentation on the up coming 2008 Youth Tourney which will be conducted on Guam in July, 2008.